For Prelims and Mains: Vernal equinox- meaning, changes associated and features. Context: March 20, 2019, marks the spring equinox — the first official day of spring in the Northern Hemisphere. This day is unique in that the length of day and night are close to equal. The Vernal Equinox is a solar term with great balance. At the equinox, earth’s two hemispheres are receiving the sun’s rays equally. On the day of the vernal equinox, night and day are often said to be equal in length. 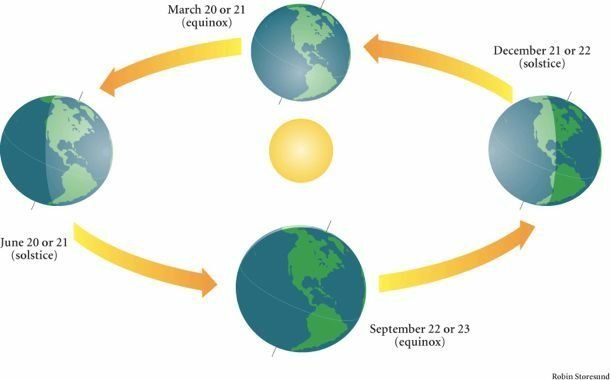 The equinox is the moment in Earth’s orbit when the sun appears to cross the celestial equator. It means longer and warmer days as the northern hemisphere begins to tilt towards the sun. The vernal equinox also is the Persian New Year, known as Nowruz. For more than 300 million people worldwide it’s the start of a monthlong celebration of new beginnings. Holi, a major festival in India that marks the start of spring, also begins on March 20 this year.